Throughout its history, Lumbarda was a region of overlap of different peoples and cultures. Based on current knowledge, the first inhabitants were the Illyrians, who ruled the island during the Bronze and Iron Ages. Their artefacts are mainly the graves and strategic stone stacks, concentrated primarily in the western areas of Lumbarda. With intrusion of Greek interest in the Adriatic, the island emerged from historical anonymity to become known as Korkyra Melaina (Black Korkyra). To Greeks, this area was of great importance, because at the Black Corcyra they have raised even two of its colonies. The later colony was founded in the 3rd century, in Lumbarda. 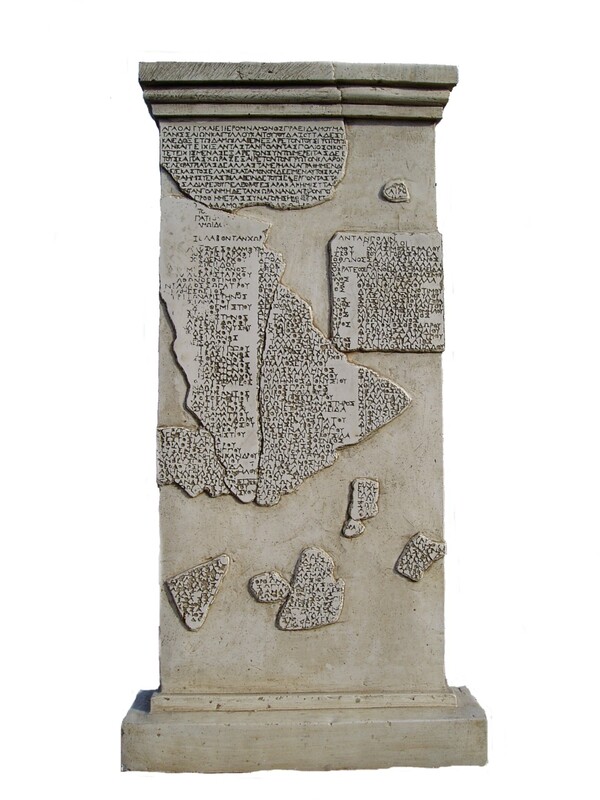 Witness of this historic event is the most famous and most ancient stone inscription found on the Croatian soil. This is a Lumbardian “Psephisma” held by the Zagreb Archeological Museum. The decree details are those of the founding of the colony. The text, among other things, reveals that the Lumbardian colony was founded by Greeks from the island of Issa, todays Vis, based on previous contracts with the local representatives of the Illyrians, Pilos and his son Daz. LUMBARDSKA PSEFIZMA was found at the top of the hill Koludrt, where probably once stood the town of Issa. To the south, in the Sutivan, there was a necropolis colony from which Greek vases, now stored at the City Museum in Korčula, originated. Greek colonization marked the beginning of the end of the Illyrian era on Korčula, but their real downfall was at the Roman emperor Octavian invasion, 35 years before Christ. Soon after this dramatic event, the island was slowly populated by Roman families. One of them owned a spacious villa from the 1st century, situated in the area of ​​Knežija, in the Lumbardian district called “Velo poje”. Other than the dimensions, this object points of the simple construction of small pyramidal blocks placed in the narrow net. It is a technique of opus reticulatum, typical for the area of Roman Italy, and the Lumbardian villa is the only one of the sort in the east Adriatic coast. Significant Roman remains are found in the area of Koludrt and Sutivan. At Sutivan, thermal set of the smaller settlement with the accompanying necropolis was founded. Also, in the Lumbardian waters were founded traces of Roman quarries on the islands Sutvara, Vrnik and Kamenjak. Late Antiquity in the region reflects mainly through remains relating to the early Christian era. Among them, the best preserved church is St. Barbara on the island Sutvara, dating back to the 6th century. The absence of early medieval finds evidence in favor of the assumption that, at dusk Antique, Lumbarda has been completely deserted. Her name is first mentioned in the Korčula statute, which is originally compiled in 1214th year. One of its provisions prohibits the permanent settlement of Lumbarda and imposes fines for those who might even want to spend the night. Therefore, it is not surprising that the only witnesses of this time are two religious buildings, the church of St. John at Sutivan and the church of St. Barbara at Žabnjak. The first was also the oldest church in Lumbarda, because in 1388. it was mentioned as a ruin. It was renovated several times, up until 1893., where on its old remains, a new church was built. St. Barbara at Žabnjak was probably built in late 13th century, but it is renewed; first in the 1728., and again in the 19th century when it received its present form. In 1420., Korcula came under the long rule of the Venetian republic, and since then it has shared the fate of Dalmatia. With the stabilization of existential circumstances began the continual settling in Lumbarda. In the 16th century there has already been formed a settlement, grouped around churches and built mainly on private land of Korčula’s nobility. The oldest among them was the parish church of St. Roch at “Vela glavica”. Probably built inthe early 16th century, as in the 1561. its expansion is mentioned. The current form was received in 1886th, and the tower was erected in 1996. In the 16th century the church of St. Barthol in “Vela postrana”, the church of St. Peter and Paul at “Vela glavica”, the church of the” Visitation of Mary (Gospica)” at “Mala glavica”, and the church of St. Cross were built. Church of St. Cross was restored in the 1774., and the lodge was added at 1881., because it was necessery to accommodate the increasing number of believers during the expansion of the main church in “Vela glavica”. Parish of Lumbarda, founded in the 16th century, was first mentioned in 1612., at the pontificial synodin Korčula. From the same century originate registers: marriages from 1620., deaths from 1635., and baptisms from the 1641. In the 17th and 18 century, Lumbarda was the countryside residency for Korčula bishops and nobles. The first preserved mansion belonged to the Bishop, and was built in the 15th century, in the cove of “Bilin Zal”. However, two centuries later, the countryside architecture gained full momentum, where the favored areas were “Tatinja” and “Prvi žal”. At that time castles were built, which, besides economic, also had a defensive function. So Cankin and Nobilo’s castles above the Tatinja bay and the Tower in “Velo poje”, with its verticals, still dominate the landscape to this day. Nineteenth and twentieth centuries were characterized by the formation of various religious and cultural associations. At 1857. the Fraternity of St. Sacrament was formed, and later Holy Brotherhoods of St. Rocco and Our Lady of Carmel joined the Fraternity. Folk music was based at 1929., and the church choir at 1935. One of the last things founded were the cultural association “Ivo Lozica” (1980. ), and Women’s and children’s church choir. (1999). In the early 20th century, two youngest religious buildings in Lumbarda were raised. These are the church of St. Špiridijun in the hamlet Javić which dates from 1900., and Chapel of Our Lady of Lourdes in the foothills of Koludrt in 1922. Many Lumbardian artist gave its stamp in this period, some of which acquired world fame. Among them, the sculptors Frano Kršinić (1897. – 1982. ), Ivo Lozica (1910. – 1943. ), Lujo Lozica (1934. ), an amateur sculptor Ivan Jurjevic – Knez (1920)., a painter Stipe Nobilo (1945. ), and conductor Ivo Lipanović (1958.). Gallery Ivan Jurjević – Knez, Lumbarda.